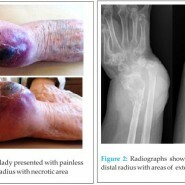 Extranodal Non-Hodgkin Lymphoma as a differential of Swelling around the wrist. Department of Trauma and Orthopaedics, Royal College of Surgeons, Ireland. Introduction: Primary musculoskeletal extranodal non-Hodgkin lymphoma is a rare presentation and account for 5% of all primary extranodal non-Hodgkin lymphomas. Treatment uses a combination of chemotherapy and radiotherapy with good prognosis in unifocal manifestation. We report an unusual case of primary musculoskeletal extranodal lymphoma presenting as a soft tissue swelling around the wrist. Case Report: A 75 year old lady was referred to the Orthopaedic outpatients department with a painless, slowly growing mass on the dorsum of the right wrist. Clinical examination revealed a 6 X 9 cm round painless mass on the dorsum of the distal radius adherent to both the underlying structures and skin. MRI of the wrist showed a large mass causing extensive osteolysis of the distal radius and extending proximally with abnormal replacement of the marrow. The patient was brought to theatre for biopsy and subsequent histopathological examination confirmed a B-cell non-Hodgkin lymphoma. The patient was referred to the Haematology Service for further treatment and follow-up. She received chemotherapy and radiotherapy with satisfactory results. Conclusion: Lymphoma presenting as a soft tissue mass is relatively uncommon and can easily be confused with a wide variety of inflammatory conditions, more common neoplasias as well as infectious diseases (tuberculosis). Though rare, extranodal lymphoma should be regularly included in the differential diagnosis of mass lesions. Keywords: extranodal lymphoma; B-cell non-Hodgkin lymphoma; soft tissue mass. Primary musculoskeletal extranodal non-Hodgkin lymphoma is a rare presentation and account for 5% of all primary extranodal non-Hodgkin lymphomas . At least one quarter of non-Hodgkin lymphomas arise from tissue other than lymph nodes and even from sites which normally don’t contain lymphoid tissue [2,3]. These forms are referred to as primary extranodal lymphomas. Musculoskeletal lymphomas are rare entities and only 5% of these are primary extranodal non-Hodgkin lymphomas . 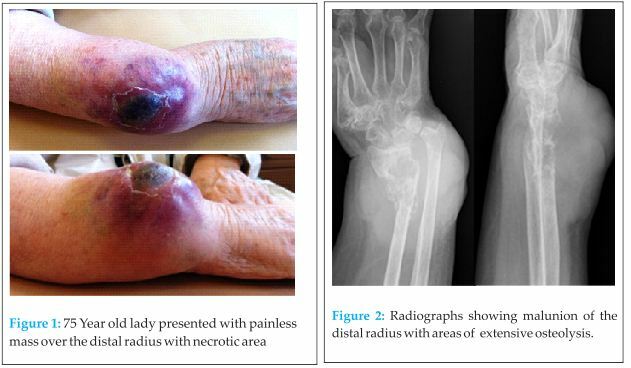 We describe an unusual and dramatic presentation of a patient diagnosed with this rare condition emphasising on the importance of having a good knowledge of the existence of other not so common possible diagnoses. A 75 year old lady was referred to the Orthopaedic outpatients department with a painless, slowly growing mass on the dorsum of the right wrist. She first noticed the swelling a year previously and attended her local doctor who felt it was a ganglion. Past medical history included hypertension, osteoarthritis, polymyalgia rheumatica and malunion of a right distal radius following a distal radius fracture sustained 5 months prior for which she declined surgical intervention (Fig 3,4). Clinical examination revealed a radially deviated wrist with a classic dinner fork deformity. There was a 6 X 9 cm round painless mass on the dorsum of the distal radius adherent to both the underlying structures and skin which did not transilluminate and with necrotic area of overlying skin (Fig.1). Radiographs releaved old distal radius fracture which was malunited into radial deviation with extensive area of osteolysis at the fracture site (Fig. 2). General physical examination was unremarkable with no obvious lymphadenopathy, no breast masses, no organomegaly and clear lung fields. Her right hand had capillary refill of under 2 seconds, palpable radial and ulnar pulses and normal sensory and motor exams. Mantoux test was negative making TB an unlikely cause. Blood count, renal and liver function were within normal range, ESR 74 (elevated), haemoglobin 11 g/dl. On ultrasound scan there was a large vascularised soft tissue mass infiltrating the tendinous structures on the dorsum of the right wrist. MRI of the wrist showed a large mass causing extensive osteolysis of the distal radius and extending proximally with abnormal replacement of the marrow in the distal one third of the radius. The soft tissue component of the mass involved the entire extensor tendon groups and infiltrated through the subcutaneous tissues to the dermis (Fig. 3,4,7). CT thorax abdomen and pelvis and whole body bone scan confirmed that this was an isolated lesion with no evidence of dissemination. The patient was brought to theatre for biopsy following consultation from the National Musculoskeletal Tumour Centre. Subsequent histopathological examination confirmed a B-cell non-Hodgkin lymphoma (diffuse large B-cell lymphoma -DLBCL- right wrist-stage 1EA). The patient was referred to the Haematology Service for further treatment and follow-up. She received chemotherapy (R CHOP C6 plus Rituximab and R CHOP C4) and radiotherapy (IFRT) with satisfactory results that caused the mass to shrink considerably (more than 50% after the first cycle of radiotherapy) and subsequent CT scans didn’t show any evidence of metastases. Despite her good response to the therapy, this lady died from causes not related to her primary diagnosis (pulmonary embolism). True primary lymphomas of soft tissues are extremely rare and there are few well-documented cases in the literature . Treatment of primary non-Hodgkin’s lymphomas uses combinations of chemotherapy and radiation therapy. Operative treatment is reserved for the treatment of complications. The prognosis of primary non-Hodgkin’s lymphomas is reflected by 10-year-survival-rates without recurrence of more than 80% in unifocal manifestations . Lymphoma presenting as a soft tissue mass is relatively uncommon and can easily be confused with a wide variety of inflammatory conditions, more common neoplasias (sarcoma, plasmocytoma, metastasis) as well as infectious diseases (tuberculosis) . Extranodal involvement by lymphoma has been described in every tissue of the body with multiple different appearances even within one organ system. Thus, it should be regularly included in the differential diagnosis of mass lesions . Extranodal lymphoma is a rare entity that can mimic a wide range of more common conditions . It is important to have a high index of suspicion when assessing a mass and differential diagnosis should always include lymphoma. 1. Ludwig K Musculoskeletal lymphomas, Radiologe. 2002 Dec;42(12):988-92. 2. Zucca E, Roggero E, Bertoni F, Cavalli F. Primary extranodal non-Hodgkin’s lymphomas. Part 1: Gastrointestinal, cutaneous and genitourinary lymphomas. Ann Oncol 1997; 8: 727-737. 3. Bertoni, F., Sanna, P., Zucca, E., Roggero, E., Cavalli, F Primary extranodal lymphoma of skeletal muscles: A report of four cases, Oncology Reports Volume 5, Issue 3, 1998, Pages 605-607. 4. 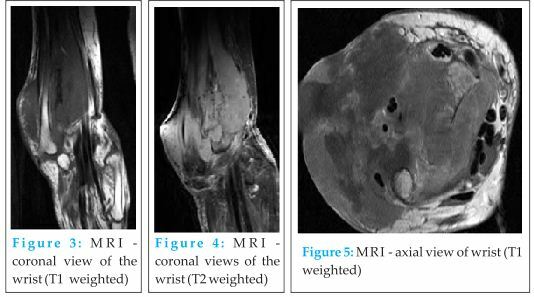 Komatsuda M, Nagao T, Arimori S. An autopsy case of malignant lymphoma associated with remarkable infiltration in skeletal muscles. Rinsho Ketsueki 1981;22:891–895. 5. Travis, W.D., Banks, P.M., Reiman, H.M. Primary extranodal soft tissue lymphoma of the extremities, American Journal of Surgical Pathology Volume 11, Issue 5, 1987, Pages 359-366. 6. Choudhury, J., Yalamanchili, M., Friedenberg W Skeletal muscle lymphoma, Medical Oncology Volume 19, Issue 2, 2002, Pages 125-129. 7. Adam G. Thomas, Ramachandran Vaidhyanath, Rathy Kirke Arumugam Rajesh Extranodal Lymphoma From Head to Toe: Part 2, The Trunk and Extremities, Nuclear Medicine and Molecular Imaging August 2011 vol. 197 no. 2 357 – 364.